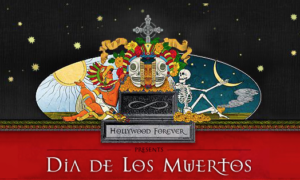 In just about 3 weeks, the 18th annual Dia de los Muertos (Day of the Dead) Festival takes place at the amazing Hollywood Forever Cemetery. This is one of the most unique Halloween season activities in all of Los Angeles. This year’s theme is The Legacy of Posada, honoring Mexican artist Jose Guadalupe Posada. His art and images 100 years later, still provide so much of the foundation to this annual tradition. Dia de Los Muertos Hollywood, takes place on Saturday, October 28th, 2017, from Noon until Midnight. Get there early to avoid the after dark rush, and 100% look into UBER’ing or public transportation. Street parking will be nearly non-existent in the general vicinity along Santa Monica Blvd. One might even think about entering from Sunset on the north or Melrose Avenue on the south. View the Dia de los Muertos Hollywood website for parking structures at nearby studios like Paramount, and Sunset Bronson. Admission is $20 per person, and children 8 and under, and seniors 65 and older are free until 4PM. Pre-purchase tickets to avoid lines. 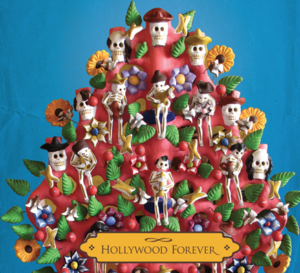 The event features include over 100 altars created by the community to remember their loved ones and ancestors, hundreds of Aztec Ritual Dancers in costume, a children’s art project area, a costume contest for the best dressed Calaca (skeleton) and musical performances by Grammy Award winning performers. Visiting a cemetery isn’t for everyone, but most of our guests are amazed at this incredible park and its history. There’s always life at Hollywood Forever Cemetery. This includes Cinespia and their weekly summer screening of movies that illuminate over the mausoleum wall. It’s one of our guests’ favorite locations as well, for Hollywood royalty has been laid to rest here, including Judy Garland, Mickey Rooney, Douglas Fairbanks, Rudolph Valentino, and so many others. 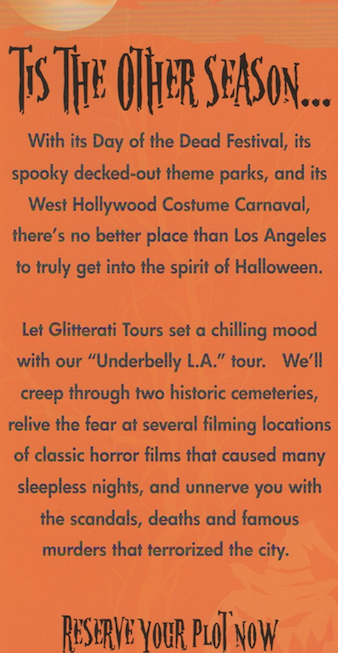 Glitterati Tours of Los Angeles can showcase this park during our Hollywood tours, or our Underbelly LA tour. 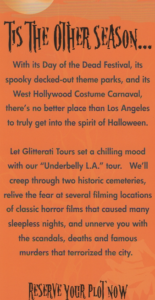 The Underbelly Los Angeles tour concentrates on the famous scandals in our city’s history, such as murder sites, suicides, over-doses, prostitution arrests, drug and alcohol offenses, career killers, scary filming locations, etc. 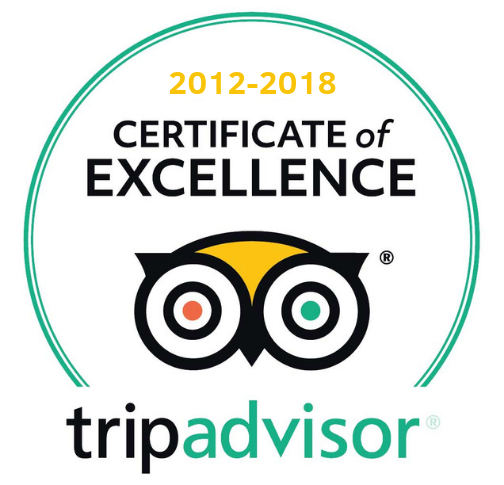 It’s one of our most popular tours, especially during the Halloween season!